Why pick a favourite dessert when you can make an all-in-one? Part chocolate cake, part peanut butter crunch, this recipe will surely satisfy both cravings. What’s more? It’s finished with a decadent spread of chocolate peanut glaze. Preheat oven to 190°C and line a 10x10 inch baking tray with baking parchment. Sift the cocoa powder and icing sugar. Whisk the egg yolks till fluffy. Whip egg whites and caster sugar to form meringue. Fold meringue into the beaten egg yolks. Followed by gently incorporating the flour and cocoa mixture. Tip the batter into the baking tray. Bake at 190°C for approximately about 15 minutes. Warm the cream, and gradually add into chocolate couverture to emulsify. Cool to set and use. In a microwave, heat up margarine and chocolate couverture. Add in peanut butter, followed by wafer crunch, and icing sugar. Reserve for assembly of cake. Sprinkle gelatine powder in cold tap water, and allow to bloom for approximately 10 mins. Microwave white chocolate couverture until melted. Whisk the egg yolk and whole egg till fluffy. In a pot, boil dairy cream and add in the bloomed gelatine. Add boiled cream mixture to egg mixture. Followed by melted white chocolate and peanut butter. Leave mixture to cool in the fridge before folding in the whipped cream. Leave to chill and set. Remove baking parchment from the sponge. Spread ganache thinly on the top side of the sponge. Spread a layer of peanut butter cream on top of the ganache. Sprinkle generously the crispy mix on top of the cream. Coat the roll cake with the chocolate ganache. 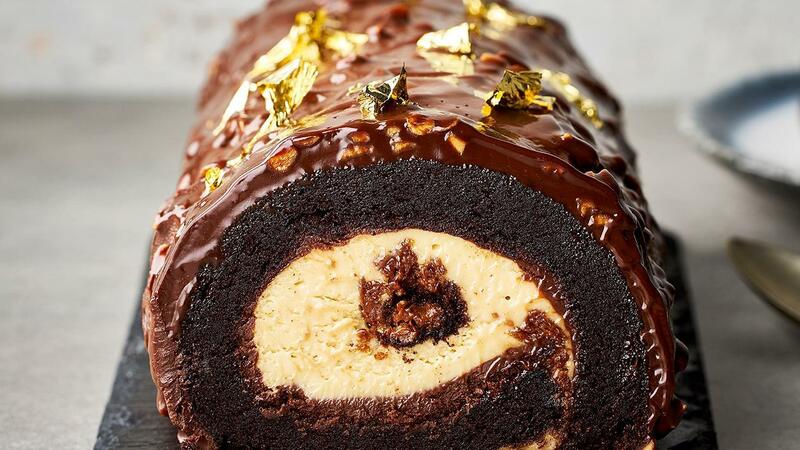 Pour the chocolate peanut glaze over the roll and deco with gold leaf. Chill the roll cake before serving.